The future of real estate is in the hands of the agent. 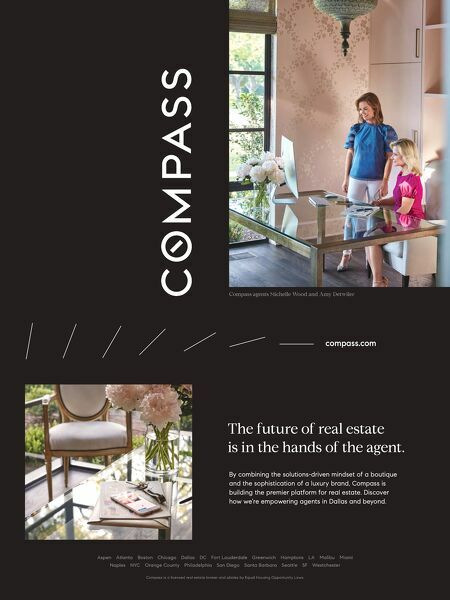 Aspen Atlanta Boston Chicago Dallas DC Fort Lauderdale Greenwich Hamptons LA Malibu Miami Naples NYC Orange County Philadelphia San Diego Santa Barbara Seattle SF Westchester By combining the solutions-driven mindset of a boutique and the sophistication of a luxury brand, Compass is building the premier platform for real estate. Discover how we're empowering agents in Dallas and beyond. Compass agents Michelle Wood and Amy Detwiler compass.com Compass is a licensed real estate broker and abides by Equal Housing Opportunity Laws.